I’ve decided to review this game as it is quite dear to me. It was one of system’s earliest games and one of the first I ever played. The earliest memories I have of my beloved SMS was enjoying, albeit struggling, playing this game. It is quite difficult and I never did get very far back then. I remember pausing the game and showing my mum how far I got when I reached level 4 for the first time. Anyway, you play as Ashura, together with your comrade-in-arms Bishamon, and you have to blast your way through enemy strongholds in search of your captured friends. 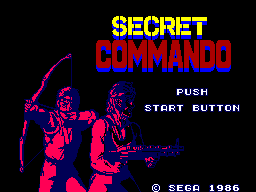 On a side note, did anyone else get confused by the fact it said ‘Secret Commando’ on the title screen? And who were those characters in the pictures on the back of the box? The game is a vertical scrolling shoot-em up where you are free to roam about on the screen but cannot go backwards. 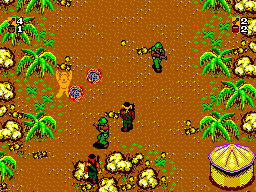 You play as a solider/commando/whatever and you’re equipped with a gun and grenade-arrows. 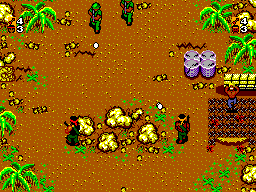 You have to make your way though the different levels of varying terrains and locations blasting a vast array of bad guys and freeing prisoners by destroying huts. When you free a prisoner they will throw you power-ups such as super-rockets and a mysterious object that kills all enemies on screen. You can also pick up long range shots and super bullets. I find it all great fun, with the only downer being that your character moves so slowly. I find it quite amusing that it’s a titanic struggle to avoid an enemy bullet by retreating backwards. The best thing about the gameplay though is that if you can find someone to play these old games with you then you can enjoy 2 player co-op. Or sometimes not so co-operatively if you’re like me and my friend, who like to blow each other up with grenade-arrows (one of us does it by accident, which starts a personal war). I’ve always quite liked the graphics in this game. Considering it’s an early title I’d say they were impressive. Each level is different and the use of colour is very good. There are jungles, moats, bridges, fields, city buildings and even futuristic elements and they all look good and immerse you. The sprites are pretty big and there are various enemies to keep you interested. The animation is pretty good too I suppose. I also like the little things, such as the flamethrower enemy, explosion shrapnel and guys on motorbikes. There isn’t any slowdown and the only flickering is to indicate you’re temporarily invulnerable. The only letdown is that it can sometimes look a bit flat. I think the music is generally pretty good. The main theme is pretty low-key but does give you the feeling that a war is about to start. The music played during the game is pretty memorable, but mainly because there are only 2 tracks that alternate between levels. The only other music is played in between levels and during the ending. It’s got your standard shooting and explosion sound effects. Strangely though, during the end credits, the music tracks are indicated to have lyrics. I wonder what they are. Pretty simple, as you’d probably expect considering the SMS controller. Move around with the D-Pad, fire you gun with button 1, fire you grenade-arrows with button 2. Simple. There may be a slight chance of a sore thumb though from constantly holding down the d-pad trying to get your character to move from one end of the screen to the other at a snail’s pace. This is a pretty difficult game, so if you intend on completing it then you will be coming back to it for a while. I still like to play it every now and then just for the pleasure. It’s a great game to play with a friend as well as it’s one of the few 2 player co-op games for the system. I’m still playing it after 20 years; I’d say that’s pretty good replay value. This game is still one of my faves and is among my top 20 SMS games. It brings back good memories for me, so I have a feeling I might being a bit biased with my review. But if you haven’t played it or really got into it, give it a fair go. It’s pretty slow but it’s good once you’re used to it. It’s a solid game and very underrated I think. If you’re looking to buy it you shouldn’t have a problem as it’s as common as muck. Happy gaming!